The theme of Main Street Delaware’s December First Friday is “Home for the Holidays,” and it’s starting to look a lot like Christmas in downtown Delaware. Though the temperatures are nowhere near freezing, there will be ice skating this weekend on the basketball court next to the Willis Education Center on William Street. 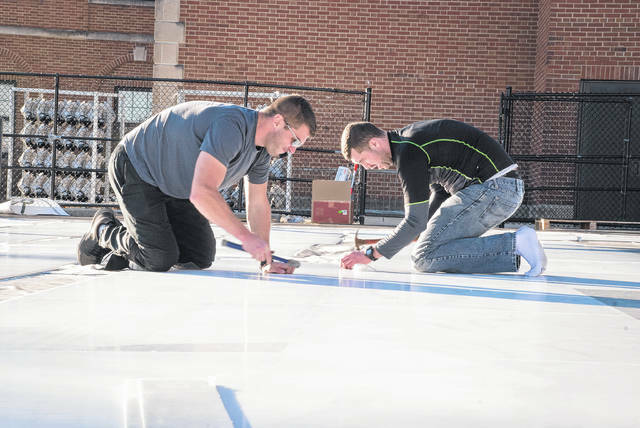 Former Columbus Blue Jacket Dan Fritsche, left, of Fritsche Sports, and Thomas Beagle, right, lay synthetic ice called Glice. The synthetic ice allows ice skating anywhere, anytime, no matter the temperature. For information about First Friday and other holiday activities this weekend in downtown Delaware, go to www.mainstreetdelaware.com. This entry was tagged Glice, ice skating, main street delaware. Bookmark the permalink.